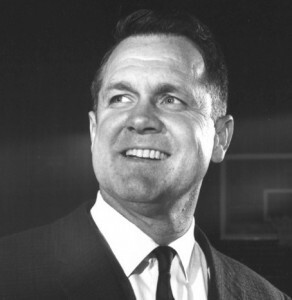 Ed Jucker became head coach at the University of Cincinnati the year after UC’s greatest player, Oscar Robertson, graduated. If the timing didn’t look good at the time, it looked much better after the Bearcats won back-to-back national championships in Jucker’s first two seasons. Starting with a 5-3 record, Jucker’s first UC team won 22 straight games, finishing the season with a 70-65 overtime upset of Jerry Lucas-led Ohio State to win the 1961 NCAA championship. The 1961-62 Cincinnati team extended its winning string to 37 games and again won the NCAA title with another victory over Ohio State in the championship game. Cincinnati went to the title game for the third straight time in 1963 but was the victim of a stunning 60-58 overtime upset by Loyola of Chicago. Jucker, who had been a UC assistant for seven years prior to becoming head coach, resigned after his fifth season with a record of 113-28. He said the job pressure was affecting his health and his family. Two years later he became coach of the Cincinnati Royals of the NBA for two years. Ed Jucker died in 2002 at age 85.